This was a baking weekend, for sure! I had first made Nutella Cookies, at the request of the kids. That’s it…that starts the baking frenzy in me. I just had to make something else. I had never tried this recipe, a recipe only using apples, crescent rolls, and…WHAT? : a can of Mountain Dew. Oh, and Paula Deen’s favorite, butter. It looked so easy, sounded great, I just had to try it! The result? Easy to make and tasty! They family raved about them and said this recipe is a keeper! 12 oz. (1 can) Mountain Dew or Sprite. *Preheat oven to 350. Spray a 9×13 pan with non-stick cooking spray. Peel apples and cut into 8ths. *Open a can of crescent roll dough and carefully separate the dough along the perforations. Place 1/8 of an apple on one segment of dough and then roll/wrap the apple in the dough. Place in the prepared pan and repeat with remaining apples and dough. Set aside. *In a medium saucepan, melt butter and add sugar and vanilla. Stir to combine. Pour butter/sugar mixture over the apples, then pour the can of Mountain Dew (or Sprite, although I’ve never actually tried it), on top of everything. Sprinkle the pan with cinnamon and bake for 40 minutes. *When the dumplings are done, remove from oven. Serve warm with sauce over dumplings. Recipe from Our Best Bites. Thanks for deliciousness! How yummy! 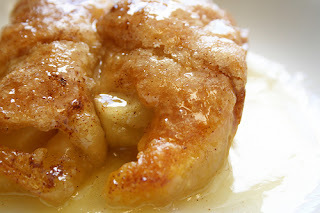 those apple dumplings look so moist. They're making me hungry :) I host a recipe swap every week and I'd love for you to come by and show off a recipe or two. Have a blessed day. OH do these look good! I'm going to make these soon. They look great, but the can of soda is the craziest ingredient ever! It must be nice and gooey though because of it. Thanks for sharing and linking up to Eat, Grow, Sew! I'll have to indulge my sweet tooth! I have a BIG sweet tooth. Would love to try these and the Nutella Cookies! I am hosting my first link-up party - Tea Time Thursdays @ Kreative Korner. Would be glad to see some of your awesome posts there. See ya at the party. I've seen a few recipes using mountain dew!! I shall have to try one! These look delicious! My daughter recently sent me a recipe that uses Mt. Dew to make cupcakes,hadn't tried it yet tho. It has been to hot to bake. These look sooooo good! Yum! Oh, I make something similar and yes, mouth watering good. Thanks for sharing at Tasty Tuesday, if you can please leave a link back in your post, that would be great so everyone can join in the fun. Mmm these look soooo good! I can't wait to make them. I would love it if you linked this up to my weekly link party so my readers can find your blog as well-Tutorial Tuesday . Thanks! These look fantastic! Can't wait to make them. I linked to you from Tuesdays Tasty Tidbits. Thanks for a great and fun looking recipe. Oh good gracious! These sound fantastic! Thank you so much for sharing. I repinned to Pinterest just to be sure I don't forget. This looks so yummy! You had me at dumplings! Sounds delicious and easy enough for me. Thanks for linking up with DIY under $5! Wow! What a delicious looking recipe! Thanks for sharing it. oh wow! !this looks incredible! Thanks for linking to Tasty Tuesday. This looks so yummy! Thanks for linking to WorkShop Wednesday!